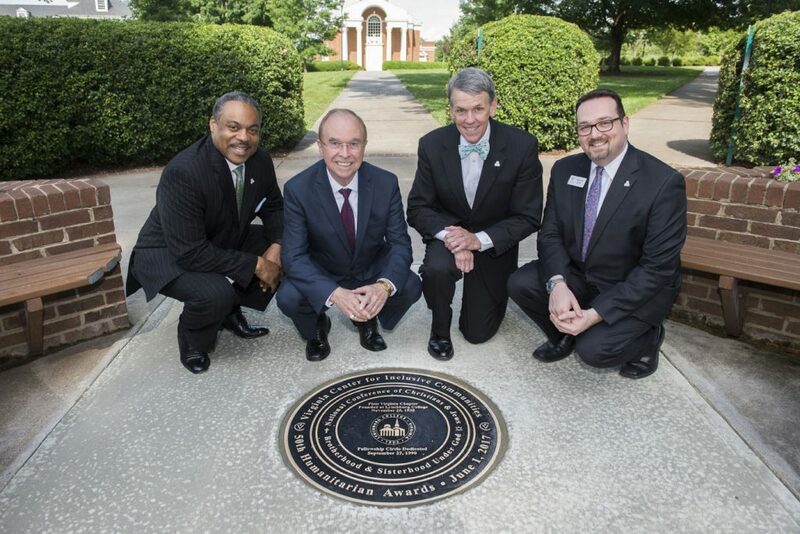 University of Lynchburg and the Virginia Center for Inclusive Communities unveiled a new seal in Friendship Circle on Thursday, June 1, to celebrate the 50th annual Lynchburg Humanitarian Awards. The emblem commemorates the founding of the first Virginia chapter of the National Conference of Christians and Jews in 1935 and an ongoing partnership to promote diversity, equity, and inclusion. The original plaque was installed in September 1990 when the College dedicated Fellowship Circle, which is now more commonly called Friendship Circle, on the Dell. In the 27 years since, the plaque received a significant amount of weathering and fading. Meanwhile, the National Conference underwent several name changes, resulting in the Virginia Center for Inclusive Communities. The center of the bright new plaque is a replica of the original design. A new band around the perimeter includes VCIC’s name and logo and a mention of the 50th humanitarian awards. Zur joined University of Lynchburg President Kenneth R. Garren, VCIC Board of Directors Chair Chavis Harris, and VCIC Lynchburg Chapter President Jim Wright to unveil the plaque Thursday afternoon. In 1935, Dr. Riley Montgomery was serving as president of University of Lynchburg when he organized a group to address concerns about intolerance in the region. The group later affiliated with the National Conference of Christians and Jews. Today, VCIC and the College continue working together as they host the annual Humanitarian Awards as well as educational meetings about diversity and inclusion on the Lynchburg campus.